Two pieces of king cake, sushi, crawfish pasta, finger sandwiches, french fries, cheese, an Oreo ball, a doughnut and alcohol. Oh, and a banana. Surprisingly not a good recipe for weight loss. (1) I bit down into a fried oyster and may have cracked my tooth on, ironically, another tooth. Actually, part of another tooth … that somehow was deposited and cooked with the oyster. It was restaurant leftovers. And, yes, I realize how completely disgusting this situation is … as it was in my mouth. (2) I watched as a group of dads (I’m sorry, I mean really tough guys) defended the honor of my friend, Vanessa, who was accosted by a large group of redneck hillbillies (I can say it, I’m from here) at the family Mardi Gras parade this weekend. Totally serious. It almost got as ugly as the people doing the accosting. 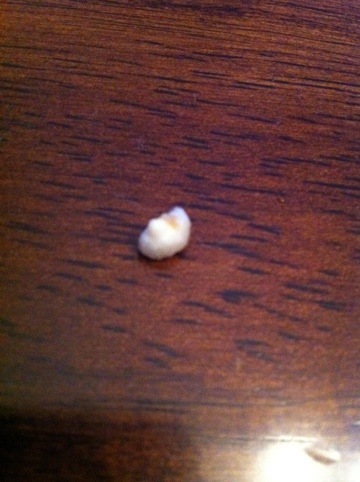 (3) I was handed a tooth at our Superbowl party yesterday. Granted, it was my daughter’s. But still … what’s with all the dental omens? 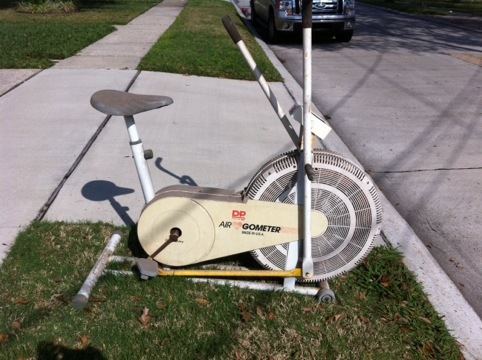 (4) I stopped to take a picture of my neighbor’s garbage … a 1960s-ish AirGoMeter (wondering if it’s Air-GO-Meter or AirGOMeter) … and contemplated “stealing” it for the purposes of my own entertainment. (5) I used a bathroom with a bidet yesterday. I thought that merited mentioning. (6) I was sold a beer at my Superbowl party yesterday by my daughter. (7) I helped a friendly stranger name her (hopefully award-winning) vegetarian chili. My suggestion? Milli Vanilli Chili. Because the recipe includes an ingredient posing as a something else. This entry was posted in Uncategorized and tagged Air Go Meter, bedet, cracked my tooth, fried oyster, mardi gras, Milli Vanilli chili, parade, Superbowl party, vegetarian chili. Bookmark the permalink. My youngest came home from school today with his tooth his teacher pulled. (First grade teacher, Jennifer, apparently she’s known for pulling teeth.) There’s definitely a dental theme going on. Geez- that is so incredibly disgusting. I am just dumbfounded. (not unusual, I realize- but speechless as well.) Wow. Did you know it was a bidet before you used? Or was it a (hopefully) pleasant surprise? There were separate seats for ‘fast forward’ and ‘rewind.’ No surprises here. Also…go manly husbands! Was your friend OK? I’m a coward. I did not. But it was at a close friend’s house so there’s ample opportunity in the future. And the experience shall be a blog post. For you, Jenny.